Blueberries demand the right climate and planting soil but take very little care if you provide suitable conditions. They are about as hardy as a peach but need a fair amount of win ter chill and will not grow well in mild winter climates. Blueberries belong to the heath family and count azaleas, rhododendrons, mountain laurel, and huckleberries among their cousins. If any of these grow naturally near your garden, or if you have prepared an artificial site that suits them, then blueberries will also do well. Blueberries like soil rich in organic material such as peat—very acid, but extremely well drained. 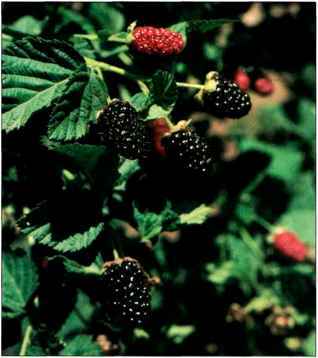 Such soils are found in areas of high rainfall, which is lucky, since the berries need constant moisture, even though they cannot tolerate standing water. There are major commercial plantings of blueberries in sandy soils in New Jersey, especially Burlington and Atlantic Counties; in certain areas of Michigan; in Washington and Oregon; and to a certain extent in New York, Massachusetts, and Indiana. Southern gardeners have a choice of two kinds of blueberries, depending on climate. 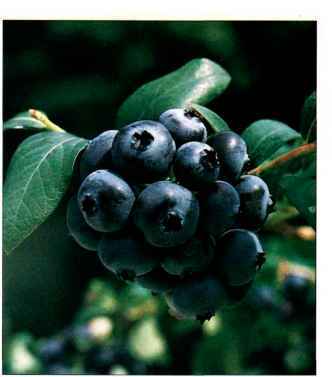 The high-bush blueberry grows commercially in large plantings in southeastern and western North Carolina. A home gardener who hopes to succeed with the plant should live in, or north of, that area. If you know of native blueberries near your home, nursery plants should do well. 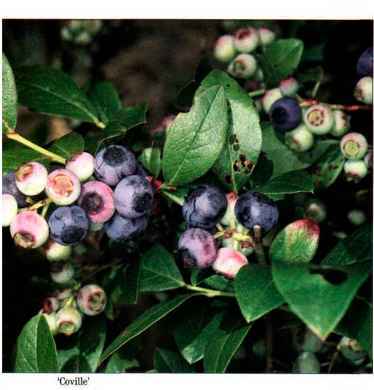 The rabbiteye blueberry, or southern high-bush blueberry, grows wild along streambeds in Georgia and northern Florida. With proper care it thrives where muscadine grapes succeed. Soil must be extremely well-drained and acid. Plant in raised areas if there is any chance of water standing around the roots. For both drainage and acidification, add large amounts of peat moss or other organic material to the planting soil, up to three-quarters peat moss by volume for soils that tend to be heavy. Never add manure; it is alkaline. Dig a planting hole somewhat broader and deeper than the roots of the young plant. Never cramp the roots into a small hole, but spread the roots in the hole. Set high-bush blueberry plants about 4 feet apart. Choose two varieties for cross-pollination. Since the rabbit-eye plants grow much larger, you can set them up to 8 feet apart, although they can also be set closer and blended into each other. Do not feed plants the first year. In succeeding years use cottonseed meal, ammonium sulfate, or any product suitable for camellias, azaleas, or rhododendrons. Blueberries require constant light moisture in the soil, and cultivating damages their shallow roots. For both these reasons, you should mulch the plants heavily. Use any organic material such as straw, leaves, peat moss, or a combination, and renew it regularly to keep it about 6 inches deep. Some materials will use nitrogen as they decay, so you will have to compensate with extra feeding. See page 52 for instructions on pruning blueberries. Blueberries suffer from very few difficulties, but birds will take them all unless you net the plants. Nurseries carry suitable netting. Always taste blueberries before picking. Some look fully mature when still quite acid. Approximately the same varieties are used throughout the country since the conditions for growing them are so similar. 'Earliblne' One of the best for all areas, this berry is large, light blue, and firm. The picking scar is small, so fruit keeps well and resists cracking. The plants are upright and comparatively hardy. Good for all zones. Widely available. Origin: New Jersey. 'Ivanhoe' One of the best berries, this is large, light blue, and firm. The plant is very tender. Good for the South. Origin: New Jersey. 'Northland' This is a hardy variety. The fruit is medium sized, round, moderately firm, and medium blue. The flavor is good. The plant is spreading but reaches only 4 feet at maturity. Good for the North and West. Locally available. Origin: Michigan. 'Woodward' Among the earliest ripening of rabbiteye types, this is a short and spreading plant. Berries are large, light blue, mildly flavored and somewhat tart until fully ripe. Best performance is in low-elevation areas of the South. Origin: Georgia. Berkeley' This large, firm berry is pale blue and resists cracking. The bush is fairly upright and moderately hardy. Good for all zones and especially for the Pacific Northwest.. Widely available. Origin: New Jersey. Bluecrop' The fruit is large, light blue, and rather tart, but stores well and is good for cooking. The berries stand cold well, which makes the plant good for the shortest Michigan growing seasons. The plant is upright and medium hardy. Widely available. Origin: New Jersey. 'Blucray' The fruit is very-large, firm, and sweet. The plant is upright and spreading. Good for all zones, and especially recommended for Washington. Widely available. Origin: New Jersey. 'Croatan' The fruit is medium sized and quick to ripen in warm weather. The plant is canker resistant, Good for the South and especially recommended for North Carolina. Locally available. Origin: North Carolina. 'Northblue' Developed by the University of Minnesota to withstand the rigors of northern winters, this is a half-high-bush type reaching about 2 feet tall—a size that gives it complete snow cover in most winters. 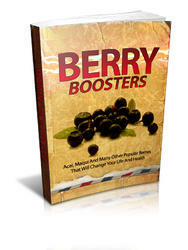 Large berries have outstanding flavor. It needs a pollinator such as 'Northsky'. Origin: Minnesota. 'Northsky' Another blueberry developed for the trying northern winters, this plant is same size as 'Northblue', but its highly flavorful fruit is smaller and produced in smaller quantity. Fall foliage is deep red. Use 'Northblue' as a pollinator. Origin: Minnesota. 'Stanley' This is a widely recommended variety. The fruit is medium sized and firm with good color and flavor. The bush is hardy, vigorous, and upright. Pruning is easy because there are few main branches. Good for the North and West. Origin: New Jersey. 'Tifblue' This rabbiteye type is a Southern favorite because of its dependable production of large, tasty berries. Origin: Maryland. Coville' Origin: New Jersey. This is an inconsistent variety with large, light blue fruit that remains tart until near harvest. The plant is medium hardy. It is good for all zones and widely available. Origin: New Jersey. Delite' This is the only rabbiteye variety that develops some sugar early. Picking is easier and flavor is excellent. The berries are medium large and may be reddish under the bloom. Origin: Georgia. 'Dixi' The name is not an affectionate term for the South but Latin for "I have spoken" or, loosely, "That's my last word." It was given by the developer, F. V. Coville, on his retirement. The fruit is large, aromatic, flavorful, and good fresh. Popular in the Northwest. Origin: New Jersey. 'Southland' The firm, light blue berries have a waxy bloom, and the skin may be tough late in the season. This is a particularly good Gulf Coast plant. Locally available. Origin: Georgia. How to grow blueberries from a blueberry? What berries nuts like akaline soil?